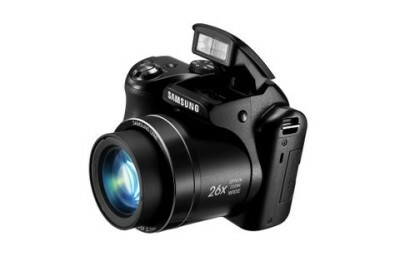 Samsung has officially announced Samsung WB110 a 20MP bridge camera . Samsung has not announced the price of Samsung WB110 but it should be priced under Rs 18,000 . The specs are not very impressive to me if said honestly . There is nothing to disappoint me other than video recording resolution of 720p only . Samsung is well known for its reliable , durable & enhanced products . The camera has 20MP CCD image sensor . Generally the sma that you find on Sony DSC H200 Cyber shot . CCD image sensor are better as compare to CMOS sensors . The WB110 has 3inch hVGA resolution monitor . The device has 26x optical zoom . The lens used in the camera is 22.3 mm wide angle . The ISO ranges from 80 t0 3200 . The camera can record 720p videos at 30FPS in MP4 format . The device has Av & HDMI terminal . It gets powered by AA x 4 batteries . The Wb110 weights 385 grams . The memory of the device will be expandable upto via 64GB (SDXC) . The device looks similar to DSLR but actually it is not . At the top of the desk there is pop up flash , Zoom controller with shutter button , mode dialer & power on / off button . There is also dedicated button for video recording as well . As always Samsung has included some additional features to make it approachable . The device will be available in Black & Red colour . At the back there are standard buttons for basic operations & 3inch screen of 320 x480 pixels . Below are some rivals of Samsung WB110 vs – . Sony DSC H200 Cyber shot .